369 Marlborough is located on the north side of Marlborough, between Hereford and Massachusetts Avenue, with 365 Marlborough to the east and 371 Marlborough to the west. 369 Marlborough was built in 1879-1880 by Vinal & Dodge, masons, for building contractor George Wheatland, Jr., for speculative sale. It was one of three contiguous houses (369-371-373 Marlborough) built at the same time and one of twelve contiguous houses (369-371-373-375-377-379-381-383-385-387-389-391 Marlborough) built for George Wheatland, Jr., in 1879-1881. He is shown as the owner of 369-371-373 Marlborough on the original building permit application for the three houses, dated December 4, 1879 (one application for three houses). The houses were built in three groups: three at 369-371-373 Marlborough in 1879-1880, three at 375-377-379 Marlborough in 1880, and six at 381-383-385-387-389-391 Marlborough in 1880-1881. The six at 369-379 Marlborough are of the same design, and the six at 381-391 Marlborough also are of the same design as each other and quite similar to the six at 369-379 Marlborough. 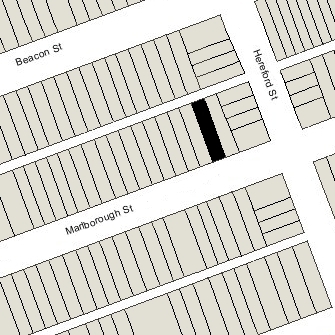 The two applications for the six houses at 369-379 Marlborough do not identify the architect. However, the application for the six houses at 381-391 Marlborough indicates that the architect was Obed F. Smith and, given the similar style, it appears likely that he also was the architect for the earlier houses. In addition, the application for 369-373 Marlborough indicates that the plans are the same as for 358–360 Marlborough, two of a group of eight houses at 348-362 Marlborough built for George Wheatland, Jr., at about the same time. The applications for those houses also do not name the architect, but are attributed to Obed F. Smith based on the final building inspection reports for 354-356 Marlborough. Click here for an index to the deeds for 369 Marlborough, and click here for further information on the land on the north side of Marlborough between Hereford and Massachusetts Avenue. George Wheatland, Jr., subsequently built the twelve houses at 369-391 Marlborough on 276 feet of the combined 280.58 foot parcel, selling the 4 feet to the east and the 0.58 feet to the west to others. As the houses were completed, William D. Pickman and the estate of William P. Fay (who had died in March of 1879) transferred their two-thirds interest to George Wheatland, Sr. He subsequently sold the houses to individual purchasers. On October 20, 1880, 369 Marlborough was purchased from George Wheatland, Sr., by Barney Cory, a wine importer. He and his wife, Eliza Ann Bell (Glynn) Cory, lived at 8 Arlington. Barney Cory acquired the property to be the home of his daughter and future son-in-law, Jennie Louise Cory and Edward Royall Tyler. They married in June of 1881 and made 369 Marlborough their home. He was a tea broker. Prior to their marriage, he had lived at 353 Beacon with his parents, John Tyler, Jr., and Martha Willis (Alger) Tyler. Barney Cory died in August of 1882, and Jennie Louise (Cory) Tyler and her brother, Charles Barney Cory, each inherited a 50 percent undivided interest in 369 Marlborough, 8 Arlington, and several other properties. On January 13, 1883, Jennie Louise Tyler established a trust to hold her properties, with Otis Everett Weld and Francis Clarke Welch as trustees. The Tylers lived at 369 Marlborough during the 1885-1886 season, but moved thereafter to a new home they had built at 316 Beacon. 369 Marlborough continued to be owned by the trust established by Jennie Tyler and by her brother, Charles. On May 8, 1889, the trust transferred the property to Edward and Jennie Tyler, and they transferred it to a new trust for their benefit and the benefit of their children, with the same trustees. Jennie Tyler died in April of 1890. On October 1, 1892, Charles Cory transferred his half interest in 369 Marlborough, 8 Arlington, and several other properties to the Tylers’ trust (at the same time, the trust transferred its half interest in several other properties to him). The Tylers’ trust continued to own 369 Marlborough until 1946. By the 1886-1887 winter season, 369 Marlborough was the home of Charles Fox Guild and his wife, Ellen (Nellie) Mary (Whyte) Guild. They previously had lived in Charlestown, where he was Paymaster (and later Pay Inspector) at the Naval Yard. They continued to live at 369 Marlborough during the 1887-1888 season, but moved thereafter to 5 St. John. By the 1888-1889 winter season, 369 Marlborough was the home of leather merchant Henry Harrison Proctor and his wife, Ellen Augusta (Perkins) Proctor. They previously had lived at the Norfolk House hotel. The Proctors’ sons, Francis Ingersoll Proctor and Charles Anderson Proctor, lived with them. Francis Proctor was a physician and ophthalmologist, and maintained his office at 176 Charles. He married in December of 1891 to Mary L. (Stevens) Putnam, the former wife of Henry W. Putnam. After their marriage they moved to 259 Beacon, where he also moved his medical office. Charles Proctor continued to live with his parents and worked in his father’s leather business. By 1900, the Proctors had been joined by Ellen Proctor’s sister, Sarah Elizabeth (Perkins) Stimpson, the widow of Thomas M. Stimpson, who had died in September of 1898. He had been a lawyer in Peabody. Henry and Ellen Proctor, Charles Proctor, and Sarah Stimpson continued to live at 369 Marlborough until mid-to-late 1900, when they moved to 282 Commonwealth. After they moved, 369 Marlborough became the home of their son and daughter-in-law, Francis and Mary (Stevens) Putnam Proctor. In 1898, they had lived in an apartment at Haddon Hall at 282 Berkeley; he continued to maintain his medical office at 259 Beacon. Francis and Mary Proctor continued to live at 369 Marlborough during the 1901-1902 winter season, but moved thereafter to an apartment at The Charlesgate at 535 Beacon. By 1904, they lived in an apartment at 384 Commonwealth and he maintained his office at 397 Marlborough. By the 1902-1903 winter season, 369 Marlborough was the home of real estate broker Frank Thomas Vose and his wife, Dora (Bennett) Vose. They previously had lived at 93 Sedgwick. 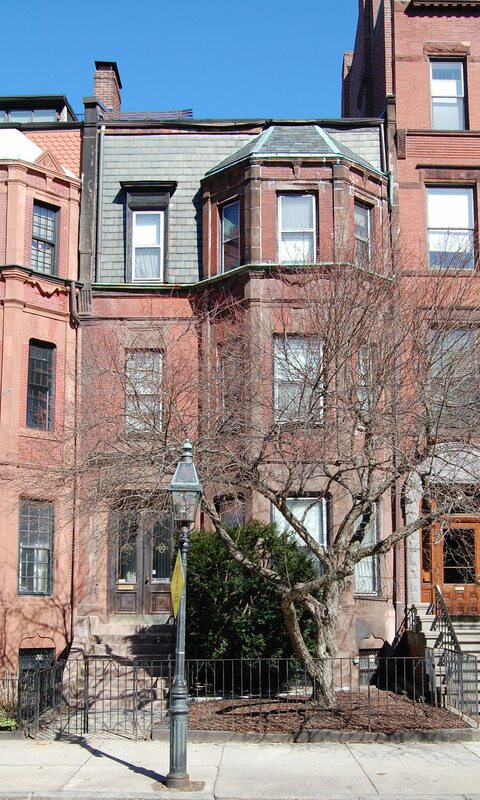 They continued to live at 369 Marlborough during the 1908-1909 season, but moved thereafter to 193 Bay State Road. 369 Marlborough was not listed in the 1910 Blue Book. By the 1910-1911 winter season, 369 Marlborough was the home of iron manufacturer Elmer F. Smith and his wife Delia P. (Robinson) Smith. They previously had lived in Marion, where they continued to maintain a home. They continued to live at 369 Marlborough during the 1915-1916 season, but moved thereafter to 124 Bay State Road. .
369 Marlborough was not listed in the 1917 Blue Book. By the 1917-1918 winter season, it was the home of attorney William Dall Turner and his wife, Mabel (Williams) Turner. They previously had lived in Brookline. They continued to live at 369 Marlborough during the 1919-1920 season, but then moved back to Brookline. 369 Marlborough was not listed in the 1921 Blue Book. 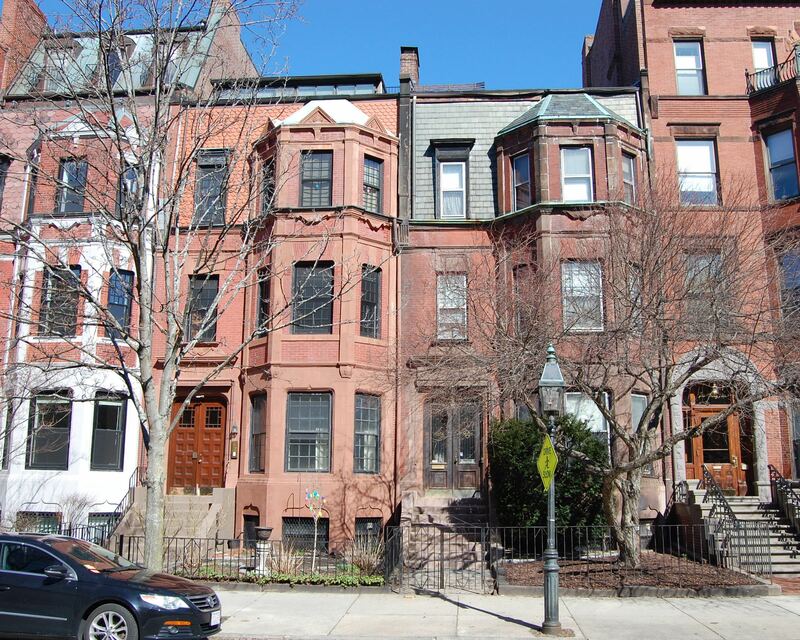 By the 1921-1922 winter season, it was the Boston home of Loris Almy Miller, a bond broker, and his wife Madeleine (Tinkham) Miller. They previously had lived in Winchester and, before that, in Chicago, where they continued to maintain a home. On January 24, 1924, the basement of the house was damaged by a fire caused by defective wiring. In about 1937, Loris Miller moved to Chicago. Madeleine Miller continued to live at 369 Marlborough, but was enumerated with him in the 1940 US Census, living with him in Chicago with his mother, Matilda (Smith) Miller, the widow of Charles Kingsbury Miller, who had died in January of 1939. Madeleine Miller continued to also maintain her residence at 369 Marlborough and, from about 1940, was joined there by her unmarried brother, George Holden Tinkham. He previously had lived at 326 Commonwealth. He was a lawyer and US Congressman, and also maintained a home in Washington DC. He did not seek reelection in 1942, and retired from legal practice at about that time. By the early 1940s, Loris and Madeleine Miller had permanently separated. Her brother continued to live with her at 369 Marlborough. She also was joined by her unmarried daughter, Eleanor Almy Miller, a teacher. She previously had lived in Connecticut. On February 28, 1946, Madeleine Miller purchased 369 Marlborough from E. Sohier Welch and Thomas Motley, successor trustees of the Tylers’ trust (Edward R. Tyler had died in January of 1942 in Wales). George Tinkham continued to live at 369 Marlborough until his death in August of 1956. Eleanor Miller married that same year to Albert F. Norris, a teacher and foundry operator. After their marriage, they lived in Dorchester and Norwell. Madeleine Miller continued to live at 369 Marlborough until her death in March of 1964. On November 24, 1965, 369 Marlborough was purchased from the estate of Madeleine Miller by Dr. Vasilios Poulos, a radiologist, and his wife, Flora Poulos. 369 Marlborough remained a single-family dwelling in 2017.